Provide comfort for the family of Helen Phaneuf with a meaningful gesture of sympathy. Helen Victoria (Stahowski) Phaneuf , 91, of North Adams, MA passed away on Thursday, February 7, 2019 at Berkshire Medical Center. She was born in Great Barrington, MA, on January 14, 1928, daughter of Stephen and Mary (Napiercz) Stahowski. She attended local schools. Helen started her career at Sprague Electric Company. She then ran a day care at her home for over 20 years until retiring to care for her husband. Her husband Roland R. Phaneuf passed away in 1985. They were married in Great Barrington in 1952 before moving to North Adams. 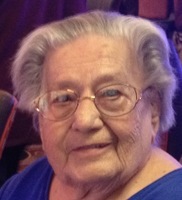 Helen’s favorite pastime was play Crazy 8’s and Trouble with her grandchildren. In addition to playing BINGO and visiting the casino Helen enjoyed giving back to the community by donating her time to the North Adams Youth Basketball, North Adams Little League and North Adams Babe Ruth concession stand for over 15 years. Helen is survived by her children Mary Phaneuf and Steven Phaneuf of North Adams, MA and Jean Phaneuf of Adams, MA; six grandchildren, who were her shinning lights, Matthew, Jessica, Erin, Dylan, Alison and Anthony; 7 great grandchildren; and two sisters Alice Corrigan and Marianne Lapinski and her husband Paul; and many nieces and nephews. She was predeceased by her daughter Gloria at birth and Victoria in infancy, brother Walter and sister Virginia. FUNERAL NOTICE: The funeral for Helen Phaneuf will be Monday February 11, 2019 at 11:00 AM at FLYNN & DAGNOLI-MONTAGNA HOME FOR FUNERALS WEST CHAPELS, 521 West Main St. North Adams. Burial will be private. Calling hours at the funeral home are Monday morning from 9-11 AM. In lieu of flowers, memorial donations may be made to Perkins School for the Blind in care of the funeral home. To add to the Book of Memories, please visit www.flynndagnolifuneralhomes.com. To send flowers in memory of Helen Victoria Phaneuf (Stahowski), please visit our Heartfelt Sympathies Store. Provide comfort for the family of Helen Victoria Phaneuf (Stahowski) by sending flowers.